Manuál v angličtíně Typ 3 r.v. 1963 » 73.1500 cc & 1600 cc motory. Podrobná kniha obsahuje spoustu kvalitních fotografií, většinou černobílých, rozsáhlá schémata pro motory, všechny momenty a řešení běžných problémů. 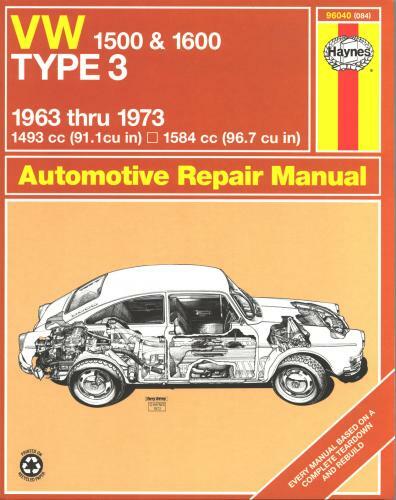 Book: Autootive Repair Manual Type 3 1500 & 1600 (English). Owner Workshop/ Repair manuals. The first thing you'll buy before starting work is a good book where everything back can find. Unfortunately few English books so far on the matter go over the series' Owner Workshop/ Repair Manuals. Through drawings and photographs (mostly black / white) is the disassembly and assembly of many air-cooled models. You following are described, inter alia: any adjustment data, all torques, solutions to common problems & extensive wiring diagrams.